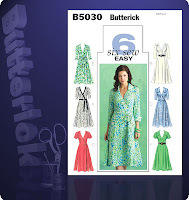 Pattern Description: Flared, wrapped dress, below mid-knee has semi-fitted bodice, front band or collar, sleeve variations. A: contrast bands and belt. View E: cuffs and single layered sash. Pattern Sizing: 8-22. I made a 12. Did it look like the photo/drawing on the pattern envelope once you were done sewing? Yes, except my cuffs flop all over the place. What did you particularly like or dislike about the pattern? I’ve made this dress last September, and I really liked the results. I like the simple style of this dress: no godets, no awkwardly placed zippers, no funky tie loops and holes. Fabric Used: Some polyester print from Joann’s. This fabric has an extremely soft hand, a nice drape, and I love its silky/satiny texture. Pattern Alterations or any design changes you made: Well…applying the facing to the neck line was real problem for me. It went fine with my first dress–no problems. But for some reason, before I could put the facing on, the neck line had stretched. I credit this to the fabric and perhaps that diagonal going along the bias. I applied the facing anyway and ended up having to take it out. I applied clear elastic to the neck line instead, although I didn’t sew it on perfectly, and there are a few puckers remaining. But at least it doesn’t gape horribly like it did before. Also I used snaps instead of hooks and eyes for the closures, along with adding a snap on the neck line so I can keep that area closed. Would you sew it again? Would you recommend it to others? I don’t think I’ll sew this again. I want to try the Vogue 8379 wrap dress which I couldn’t find at Hancock’s today. However, I would recommend this pattern. It’s really easy; you just have to pick the right fabric and know how to work with it. Conclusion: This the second piece in my Summer 2008 SWAP, which is coming along slowly but surely. Oh how cute is this! The first thing I thought was ‘I love those cuffs’! Too bad they are floppy, let us know how the buttons work out. Very nice! Pirouette, your dress is beautiful. Thanks, Berry. Actually, there already is fusible interfacing in the cuffs, but only applied to one piece. I think I may try what Toya did and add buttons to the cuffs to hold them down. It is a lovely dress for summer! Regarding the cuffs, maybe adding some fusible interfacing could help keeping them in shape… What do you think?